As you probably saw on my list of books I brought on vacation, I have dipped my toes back into Jane Austen novels again this summer. I have also read other books that I enjoyed by Hillary Manton Lodge, so when I saw that she had written a modern retelling of Sense And Sensibility, it was just meant to be! 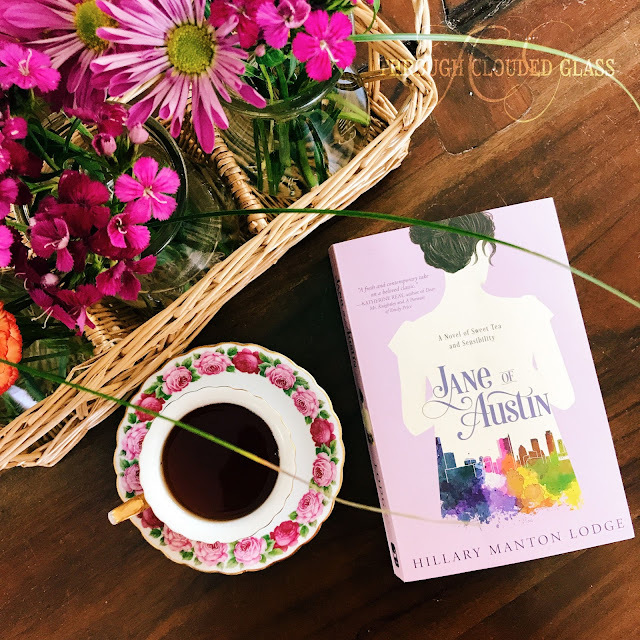 In Jane Of Austin, Jane and her sisters lose all their respectability when their father is accused of a financial crime - since they can no longer work in the financial world, they decide to open a tea parlor. However, when their landlord dies they are kicked out of their tea shop's rental space, and decide to start over again in Austin. First, I'll say that whenever I see that a novel has been published by a Christian publishing company, I expect some sort of Christian element to it, even if it's slight. However, this book really had zero spiritual references at all, and I wouldn't consider it a Christian book. So going forward with this review, I'm approaching it as a secular novel. Content: The only objections I had to the content were some sexual implications. One of the characters speculates on whether a couple of the main characters may have moved in together (they didn't). One of the characters suggestively says that Jane should "come back to his place" (she doesn't). And there is a lot of making out. These things would have bothered me more if I had been thinking this was supposed to be a Christian book, but like I said, I figured out pretty quickly that it wasn't. However, considering it is coming from a Christian publisher, I think it's just a good example of why we shouldn't necessarily trust "Christian books" to never present questionable morals. Characters: The story is told from the perspective of the "Maryanne" and "Colonel Branden" characters in this book, which I was excited about when I began reading. Their love story is my favorite one in Sense And Sensibility, and I was excited to see how the book would play out from this perspective. However, I have to say, Jane ("Maryanne") just really wasn't working for me. I liked her character well enough, but she just seemed too Type A to be really "Maryanne-ish" to me. My picture of Maryanne is that she is this free-spirited, creative type; and while Jane was creative, she was like snooty-type-A creative. Lodge tried to make her passionate and emotional, but I felt like those emotions didn't seem to fit as well on the character of Jane because I saw her as more logical/Type A. It just didn't jive with my vision of who Maryanne was. That's just my personal opinion, others will probably disagree with me here! My Thoughts: I really enjoyed the way Lodge managed to incorporate all the elements of the story of Sense And Sensibility into this book! She did a really good job, and I found myself remembering different parts of the original story as I read. I thought the tea shop aspect of it was particularly fun, and Lodge includes a lot of recipes for some of the foods mentioned in the book. She did this in her other books too, and just from the writing it is obvious the author knows what she is talking about culinarily. I just loved the extra coziness all the recipes add to Lodge's novels, and her food descriptions made me hungry. 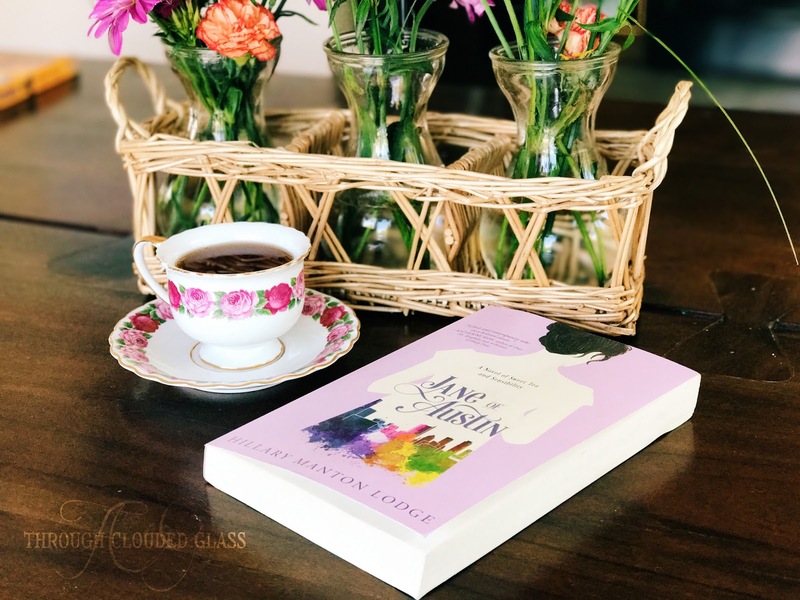 If you'd like to read a Jane Austen retelling, this one was a fun, clean one, and I'd recommend it overall! Note: I received a copy of this book for free from the publisher in exchange for a review. This is my honest opinion. Somehow June is almost over, and it still doesn't quite feel like summer around here. The weather has been so weird. It's barely rained at all, so everything is looking dry and brown - but it hasn't been the typical summer-warm either. It's like the rain is just hovering in the air, but can't get it together enough to actually do something. I bought a kiddie pool for the kids, but it hasn't felt consistently hot enough to break it out yet. The point is, June went by in a flurry and I still feel like I'm waiting for summer to really get started. We did do some fun things though. Those of you who follow me on Instagram probably saw my birthday celebration day posts, so this may not be news. Derek took us all on a hike/picnic, and then we dropped the kids off with my mom so Derek and I could go to a movie. I'll be honest, I wasn't sure if I wanted to waste my birthday date on a movie, because I haven't seen one I really liked in about two years. Everything (that's not based on a true story) is either too depressing, too politically motivated, or the character and plot development is seriously lacking. Hollywood needs to get it's act together. But we saw Guardians Of The Galaxy 2, and aside from a few crude jokes, Derek and I really liked it! It is rare to see a movie we actually enjoyed these days, and I was so happy it happened on my birthday date. On my actual birthday, Derek brought home cheesecake, the whole family lit candles and sang me "Happy Birthday", and then I got my present - a Kindle Paperwhite! I was very excited about this, because it's nearly impossible to read a Kindle book on my iPad out in the sun. Now I can read ebooks while the kids play in the kiddie pool (if the weather ever heats up enough to use the kiddie pool)! 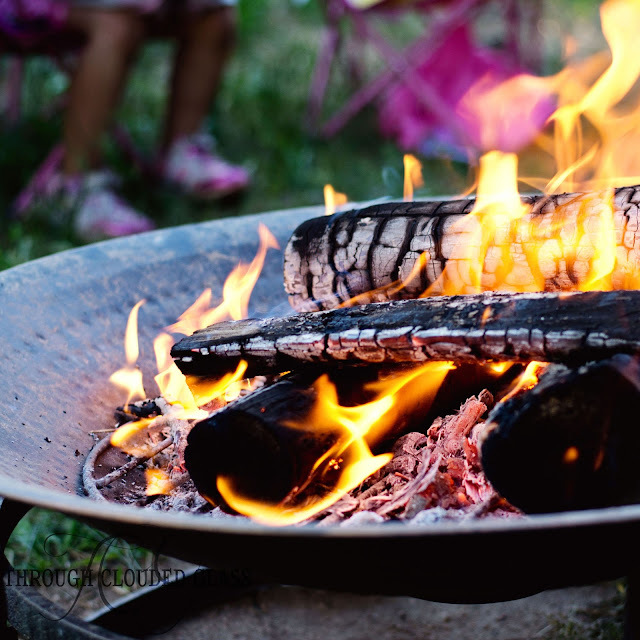 For Father's Day we went to church, and then came home and had a campfire. I bought Derek a couple books and a new game called Ticket To Ride. We played it with our friends the other day, and it's a really fun one! I lost, because I didn't have the strategy part down yet, but I have high hopes for next time. 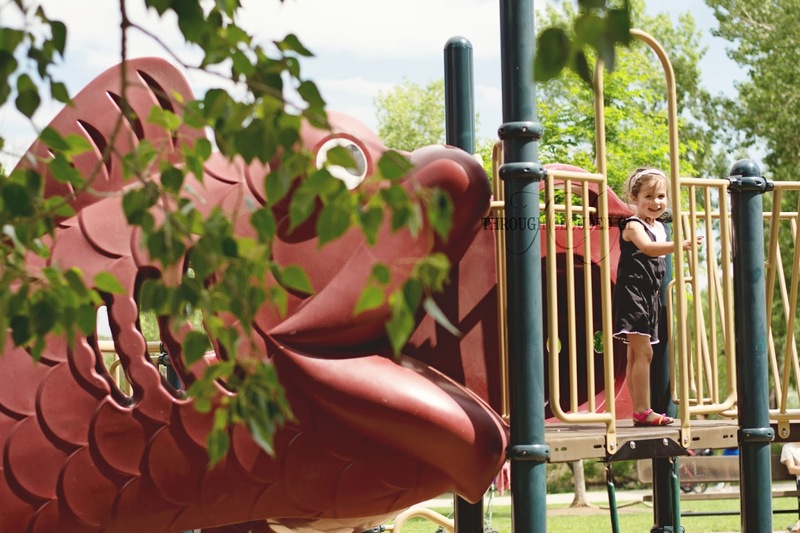 Aside from that, we've had a lot of park days with friends this month, to the point where I have given up getting a five-day week in with our summer homeschooling schedule. If we can get 2-3 days in per week I'm pretty happy, and we'll pick up the pace in the fall. 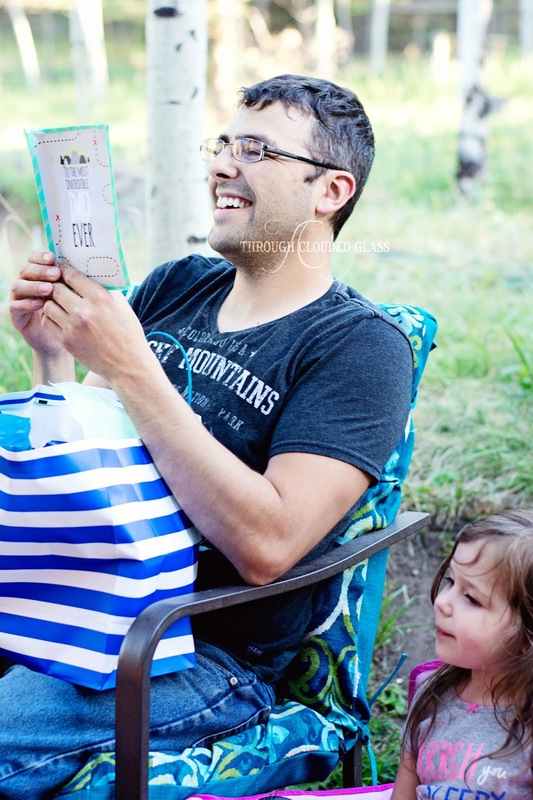 I wanted to try to get ahead before the baby comes, but on the other hand, it is summer, and I think we should enjoy the weather and everyone's scheduling freedom while we can. I've also been trying to catch up on some reading in June, and I'm currently on a Jane Austen spinoff kick. I started Persuasion and I am really enjoying it, and I've read Jane Of Austin, and Austenland. Full reviews on Goodreads, but it's been fun so far! I'm feeling the itch to switch genres again though, and I think I'm going to read a middle-grade novel next, in between all the non-fiction books I have to finish. That's all that's new around here, until Monday when we find out baby's gender! 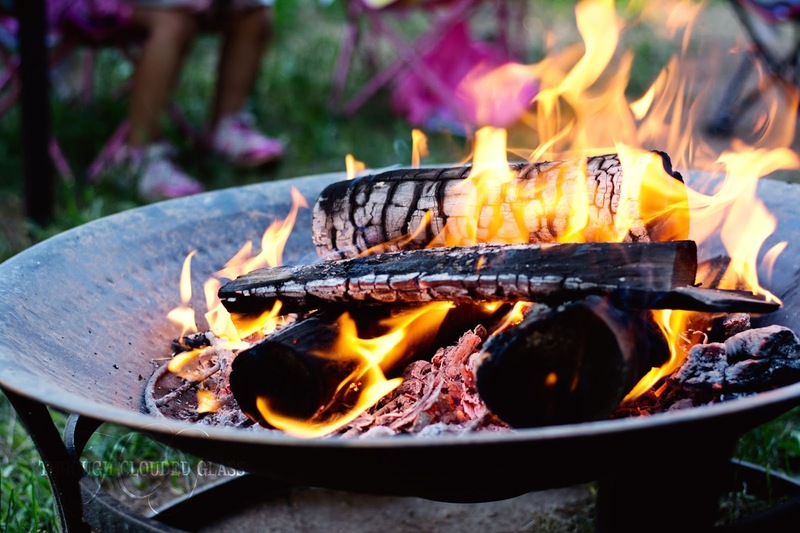 Then I'll have to get busy putting together our gender reveal party plans (we have a fire ban on now, which may mess up our party a bit...I'm hoping it'll rain so they'll lift it again). If you haven't filled out this form with your guess yet, please do, because someone who guesses right will win a little prize from me! I finished this book in one afternoon, not because I was enjoying it, but because I knew if I put it down I would probably not want to pick it up again. The plot line of this book was interesting enough, and I thought the political thriller aspect of it was written well enough. Erica is a news anchor, who investigates separatist movements around the country for a news special. Little does she know that one of them is gaining a lot of political traction and is a much bigger threat than it initially seems. Like I said, the political thriller part of the plot was interesting enough, but a few things ruined this book for me. Within the first couple chapters there are disparaging remarks about at least three different political opinions, all of which are held by the "right-wing". Erica is the "good" guy in the story, and her political opinions are no secret in this book as she expresses her more liberal viewpoints. The "bad guys" in the book come from the Republican Party or "right-wing". I thought this was poorly done. I've read Wiehl's novels in the past, and they never got politically partisan in this way. This novel could have been written without all the political statements, and it would have been much better. There was absolutely no faith element to this story at all, which surprises me since it's coming from Thomas Nelson. In addition there was some content I was surprised at in a book coming from a Christian publisher, such as minor cuss words, infidelity presented as no big deal, talk of women faking orga.sms, references to po.rno.graphic TV shows, etc. I was actually really disappointed that Thomas Nelson published this, and I don't appreciate the trend of publishing secular books under a Christian publishing company. I just really disliked the main character. She drove me nuts to be honest. Half the book was about the political plot, but the other half was about Erica's personal problems, and I honestly just wanted to slap her. She was so self-centered and narcissistic. She was stuck up, expressing disdain for small towns and the people in them. She didn't seem to think much of her husband and his career, and was so insensitive about the fact that she was in a better position in her career than he was. She seemed cold-hearted, snapping pictures of a corpse she found in a bathroom so she could investigate for her story. She was an awful mother, thinking her daughter was out to get her or ruin her career. She obliviously thinks her daughter is jealous of her, when anyone could see that her daughter just wants her mom to be with her more. She even tells her daughter in the end that she will never be the mother her daughter wants her to be because she gets annoyed at the demands of motherhood and loves her career (nice, huh?). She was hypocritical, despising the villain's ambition and quest for power when she herself seems willing to sacrifice all the things in her life that really matter on the altar of her own ambition. Bottom line, she was stuck in her own little narcissistic bubble, and really had no redemption or epiphany at the end. I might have liked the book better if the main character had been even a little likable to me, but she just wasn't. I thought it was unfortunate to publish this particular book at a time when the media's approval ratings are at such a low in the country. People don't trust the media these days, and this character certainly didn't do anything to counter that trend. 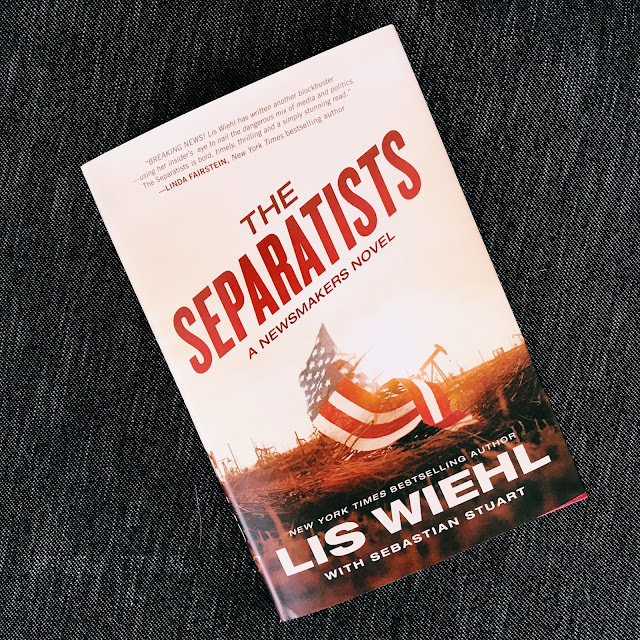 I definitely cannot recommend this book, and I'll also be hesitant to pick up another book by Lis Wiehl after the unnecessary partisan spin this book presented. I was disappointed in it. I have long been bitter that my doctor does the anatomy scan ultrasound so late. Okay, maybe "bitter" is too strong a word, but almost everyone I know gets the anatomy scan done at 18 weeks, and here I am, having to wait until 20-22 weeks. It's annoying. But we've reached 20 weeks, and our anatomy ultrasound is next Monday! I am getting so impatient and excited to see my sweet baby again. Overall, I've been feeling really great since hitting the second trimester, so there is not much new to report. I am relieved that this pregnancy has been easier than my last one. 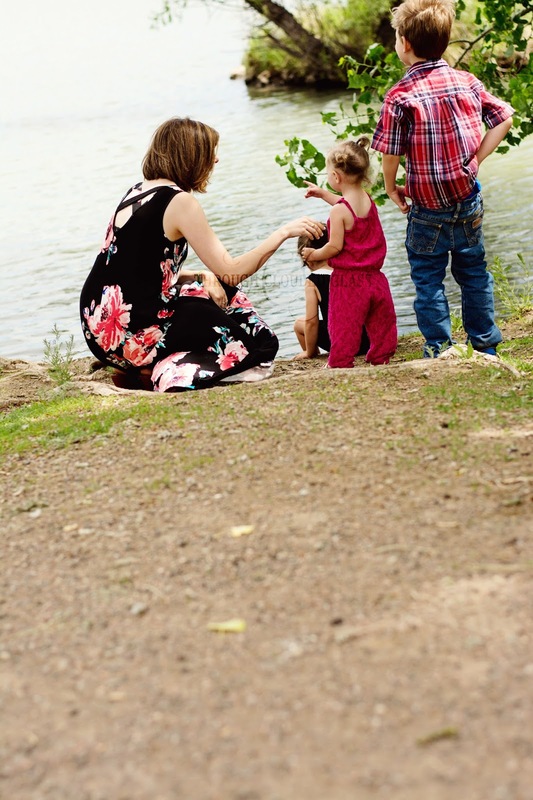 When I was pregnant with Clarice I had so much back pain every day, and part of me wondered if it was all a part of getting older - but this pregnancy has changed my mind. I'm not old, Clarice was just sitting in a really weird position (and thankfully so far it seems that this baby is not). I continue to feel little kicks every day, and I even felt one on the outside a week or so ago! Derek hasn't been able to feel baby yet, and I'm still pretty sure baby is feet-down because all the kicks are way down low. I'm looking forward to the next few weeks when I'm sure Baby will be getting bigger and the kicks will become prominent enough for Derek to feel them too. I've also weirdly started to get Braxton-Hicks contractions already, which seems really early to me (but I also can't remember exactly when I had them with previous babies). It freaked me out the first couple times, but now I get at least a couple every day, so I guess my uterus is just toning up! 1. Cravings? Not really anything, but I think in general I tend to lean more salty/sour. Sour Patch Watermelon candies are really hitting the spot lately. 2. Aversions? None, I have been SO HUNGRY the last couple weeks! It's getting to be a problem on the scale. 4. Nausea? More than last time, but not more than any of my other kids. 5. Can people tell if you are pregnant from the back? I don't think so, not yet, which is giving me great comfort in light of the aforementioned scale problems. 6. More Clumsy? I don't think so? No more than my normal level of clumsiness. 7. Carrying high or low? I'll let you all decide! Here is the comparison pic with all five babies at 20 weeks, in order. Basically Clyde still wins for being my skinniest pregnancy, and this baby still wins for looking about a month ahead of where we actually are! If you are inclined to take a guess at Baby #5's gender, go ahead and fill out the form below...because one of the people who guesses right may just receive a little surprise from me! I did this a couple pregnancies ago, and it was just a lot of fun, so I'm doing it again. Guess away, and after we announce the gender (probably on the 10th, after our party), I'll pick a winner! I read the first book in this series a few years ago, and though the ending was rushed, I really enjoyed it. 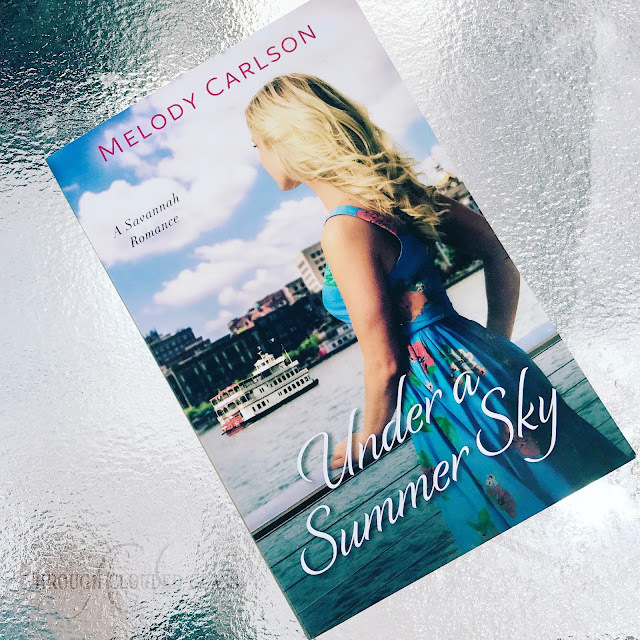 I decided to pick up Under A Summer Sky by Melody Calrson for a light, summer read. Nicole heads to her mother's friend's house to run her gallery for the summer, and get's caught in between two sons who are vying for her attention. She goes through mishaps in running the gallery and in figuring out how her relationship with one of the sons can move forward - because doesn't he have a girlfriend? First I have to say that I would NOT call this a Christian book. Aside from a couple of the characters shooting up a prayer before meals a couple times, there were no faith references at all. So don't expect much in that department. I would have loved this as a clean, romantic read, but it just irks me when it's presented as a Christian book when it really isn't. There were many references in this book to the "ghosts" in Savannah, which irked me after a while. One of the characters briefly wonders if her love interest is living with someone - once again, not really representing how important following and obeying Christ should be in the lives of those who I am assuming were supposed to be following Him. But I'm only assuming that because this was presented as a "Christian" book. But it's not. That said, for what it was, I really did enjoy this book! The story was sweet, the different plot lines were all interesting. I really liked the characters, and how it all played out. The atmosphere of Savannah was described beautifully and made me want to visit. Though the ending came quickly, I didn't feel like it was as abrupt as the previous book I've read by this author. I did feel that a couple of the storylines could have been wrapped up better though, and in that sense it still felt rushed. I always feel like this author's books could use another 50-100 pages. Still, if you want a quick, light read, this book was fun, and overall I'd recommend it! 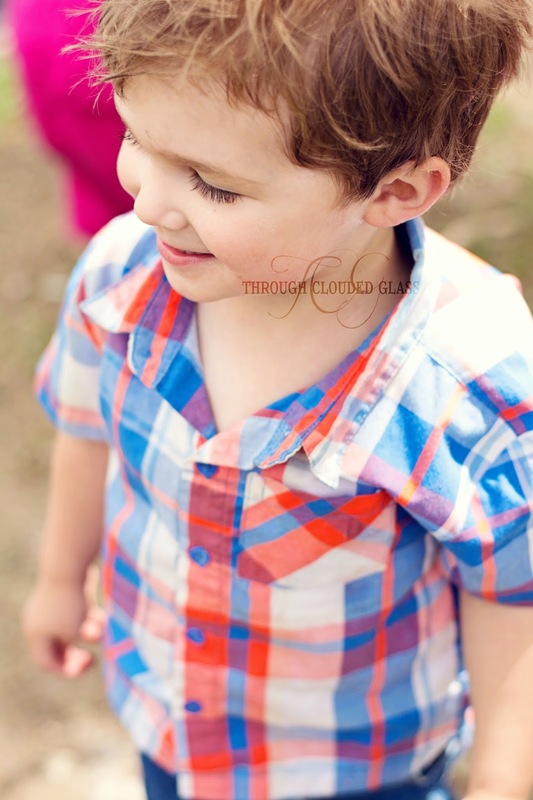 Last fall, after years of mentally planning, we started homeschooling Wyatt for Kindergarten. 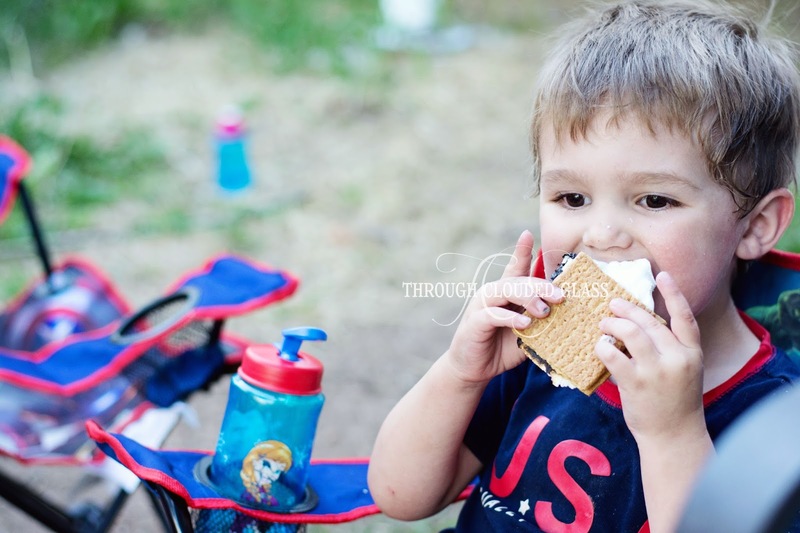 I've had a lot of interest, not only in blogland but from my real-life friends, on all the workings of our homeschool, and a frequently question is: "What you do with the baby and toddler happy while you're working with Wyatt on his school?" My first thought on that question is that if you have a younger child that's not that much younger, you probably don't have to do anything. The only thing I'd suggest buying extra workbooks for them if they decide to participate. That is what we are doing with Gwen, who was three years old when we started the school year. 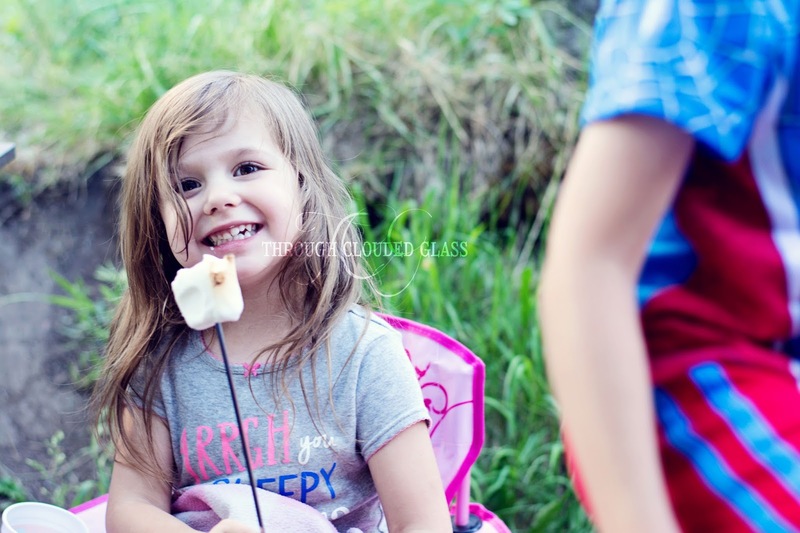 She often wants to follow along and do her own schoolwork, so I help her with the activities she's interested in - and if she's not interested, she can go and play or do whatever else she wants. I believe in letting kids be kids before the school years, free from unnecessary obligations, so I really don't put any pressure on her. The youngest two are another story. Clyde was two years old, and Clarice was one last fall, and they do require more attention. Since I was asked so often about how I was going to handle schoolwork with the little two running around, I thought I should probably have some sort of plan. 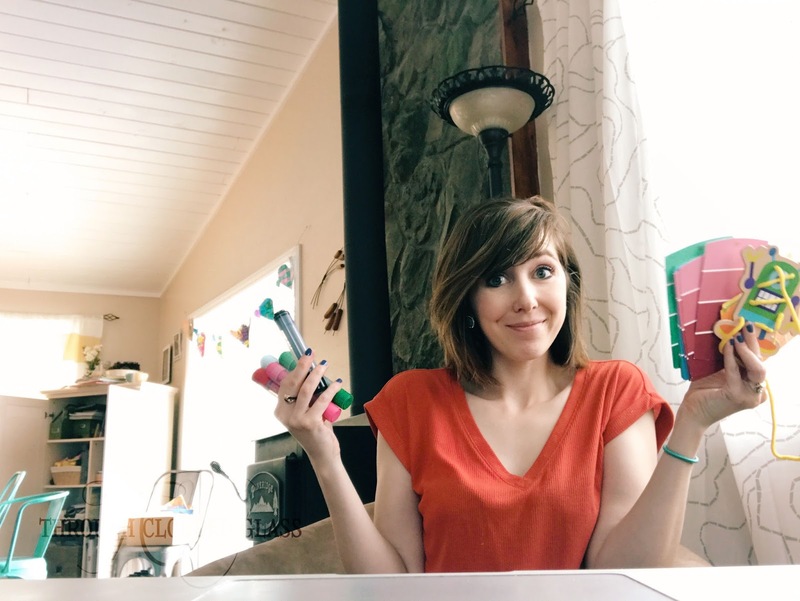 After I attended the homeschool conference and got all my curriculum choices together, I went on a mission to find activities for the younger kids while I was working with the older two. I came up with a few activities via Pinterest, and I was really excited about giving them a try (activities listed below). I also pulled aside a few of their educational toys and put them in a special box. I figured I could pull all these things out whenever we started on schoolwork, and keep them occupied with their special "school toys". 1. Nuts And Bolts Matching Activity. Buy nuts and bolts of different sizes from the hardware store, and paint the outside of the coordinating hardware the same color. 2. Clothespins and Paint Swatches. I picked up some paint cards from Home Depot - two of each color. The idea is to cut up one of the paint cards and glue a piece onto the back of a clothespin. Then the kids can pin the clothespin onto the matching color on the cards. 3. Felt Activity Books. A lot of people make their own, but I just buy the $3 ready-made version at Target. 4. Lacing Cards. Lacing shoelaces through colorful character cardboard cutouts (how's that for alliteration?). I'm sure you've seen these. All these activités are great for color matching and fine motor skills, and I patted myself on the back for being so prepared. But here's my little secret. We haven't used a single one of these activities. Do you know what Clyde (and even Clarice) like best? A notebook and a pencil. When I am working on writing or number practice with the big kids, Clyde likes to feel like he is doing the same sort of thing. He wants to do "school" too. 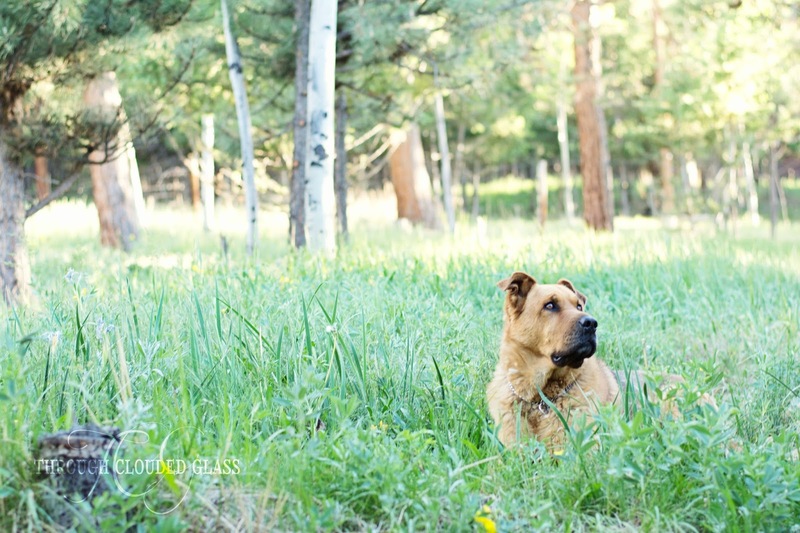 He doesn't want to be left out, or relegated to a separate activity - he wants to be part of the action. So I sit him down with his "school" notebook and a fat pencil, and he scribbles in it until we are done. I think in the midst of all those inquiries about how to keep the little kids happy while we did our schoolwork, I forgot three things. 1. My kids like to do things together as much as possible. Clyde and Clarice both want to feel like "big kids". They are always so proud of themselves when they accomplish something that they've only seen their brother and sister do up to that point. It was silly of me to think I needed to entertain them separately from what everyone else is doing. 2. All my kids have always been independent players. Most of the time while we are working on reading or anything else, the little kids just go off and play by themselves. I've never been one of those mothers who structures her preschoolers' schedule. We don't do a lot of organized projects or educational projects. I just let them play, because that is my preschool philosophy - and my kids are great at independent play. This is a big advantage in homeschooling, and I should appreciate it. 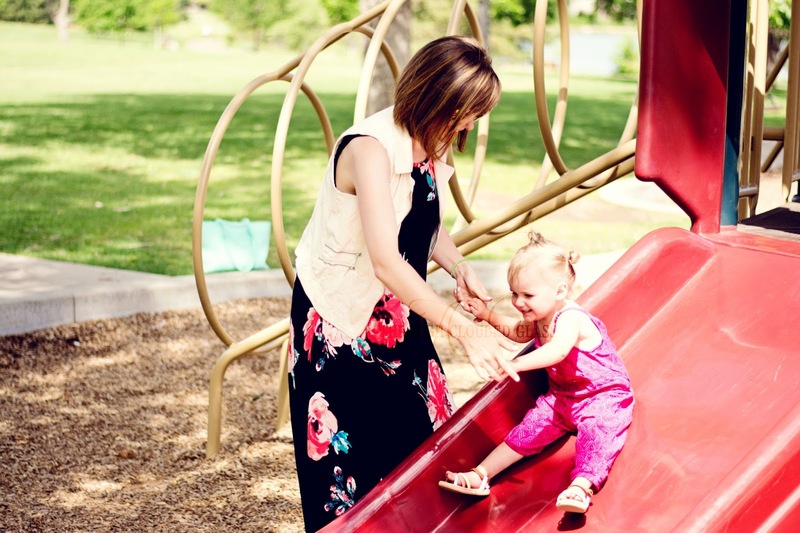 Some moms might need to plan a lot of activities to keep their younger children entertained - but I don't! My kids have always entertained themselves. I should just enjoy that! 3. Each round of work in kindergarten takes 15-20 minutes, and we take breaks in between. 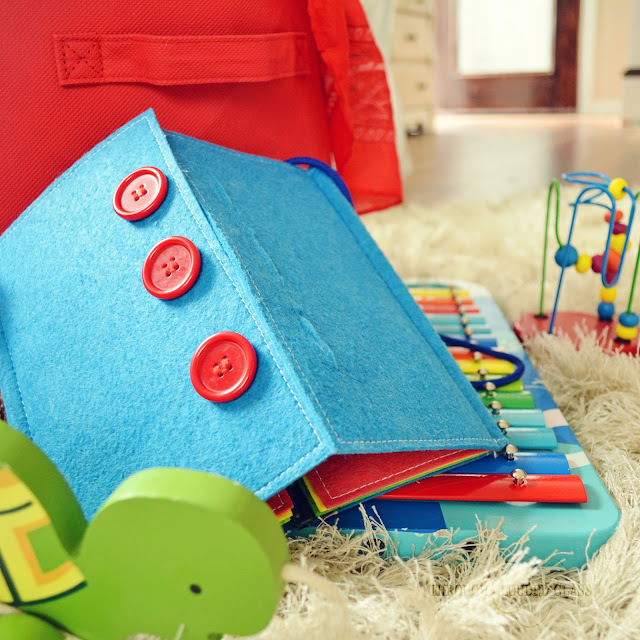 Fifteen minutes is not a big enough amount of time to have to fill it up with baby and toddler activities. 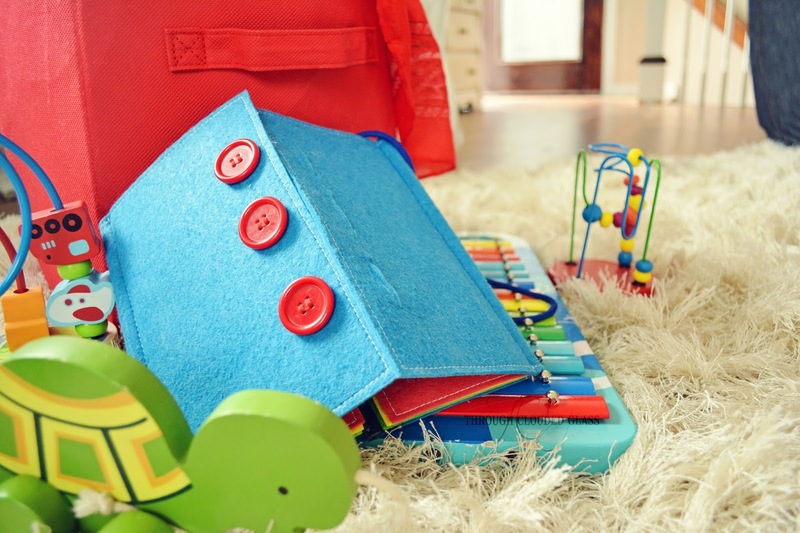 Homeschool kindergarten is not a whole-day endeavor, like public or private school counterparts, because a lot of kindergarten actives are regular life activities. 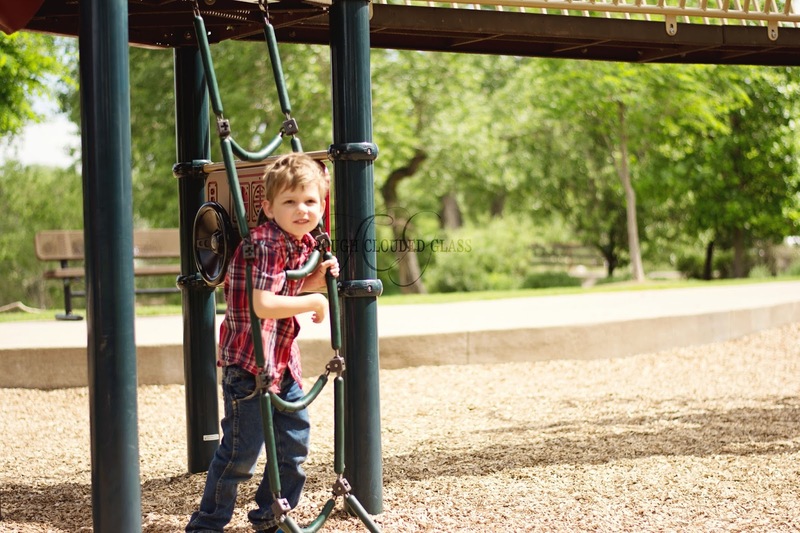 Kids have free play time. They color and paint. They eat snacks. They take a nap or "quiet time". None of which actually feels like school. The part that does feel more school-like is the bookwork, and that's the part that literally takes 15 minutes. It's really not intimidating at all, and I was making it way too complicated. 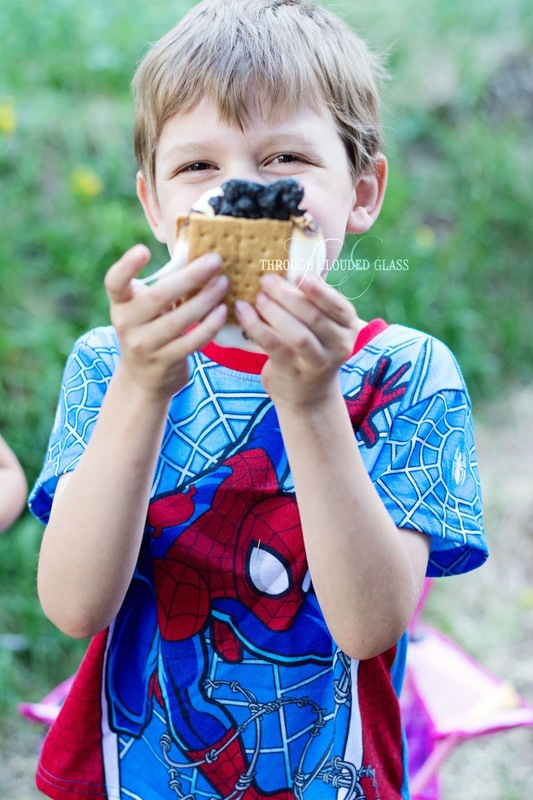 So this summer, when I'm planning for next year, I'm going to try to remember what happened this last year and restrain myself from buying a lot of fancy extras for our homeschool - because it is likely that they will go unused. I'd much rather take the kids outside and let them get dirty (or wet and cold) in the winter than spend all my time and money planning activities for them. I'd much rather do "school" all together as much as possible and continue to encourage those sibling relationships. I'd much rather just keep the whole thing simple and easy on myself, instead of overcomplicating things and adding more work to my plate. 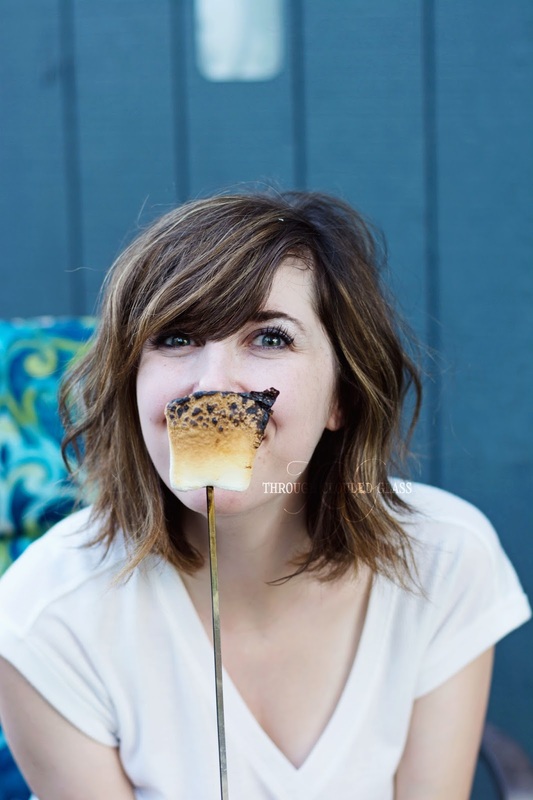 I'd rather be not-Pinterest-worthy and happy, than Pinterest-worthy and stressed. But I will probably keep my box of extras handy...just in case the littles are being extra needy one day and I need a backup plan! I went to all that work, after all. 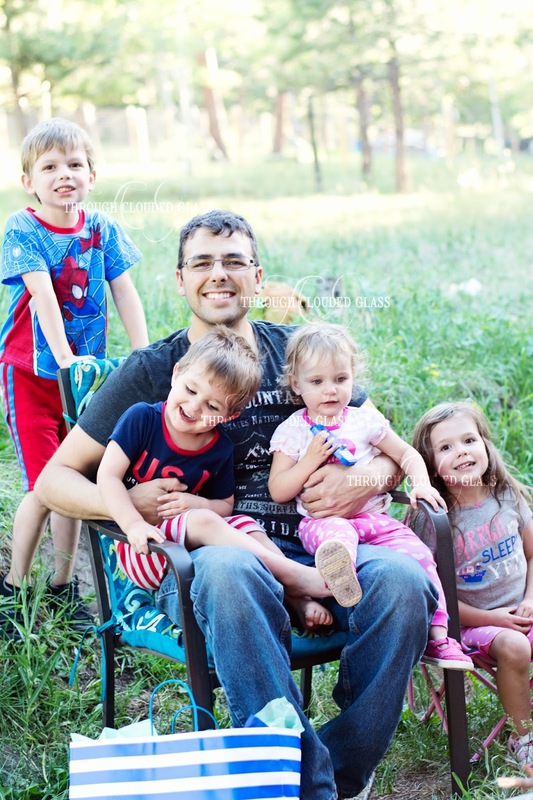 If you are a homeschool mom, especially if you have young children in the house, I'd love to hear your thoughts! 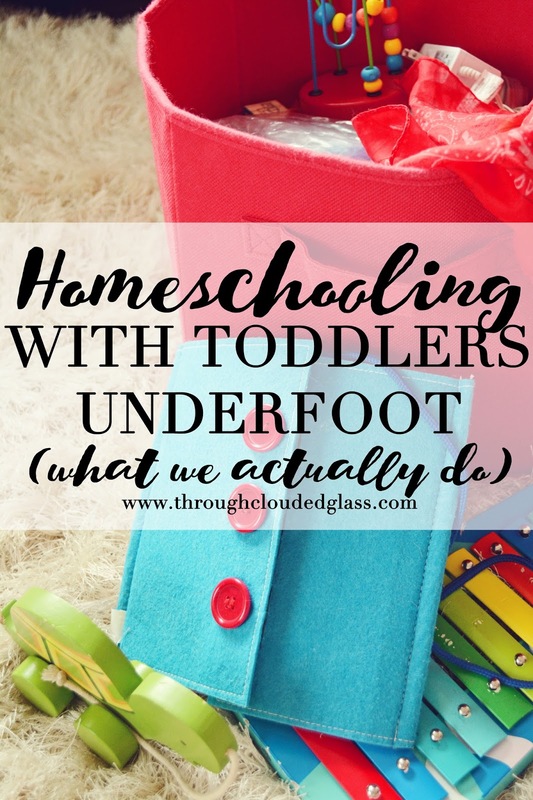 How do you make homeschooling work with babies and toddlers underfoot? 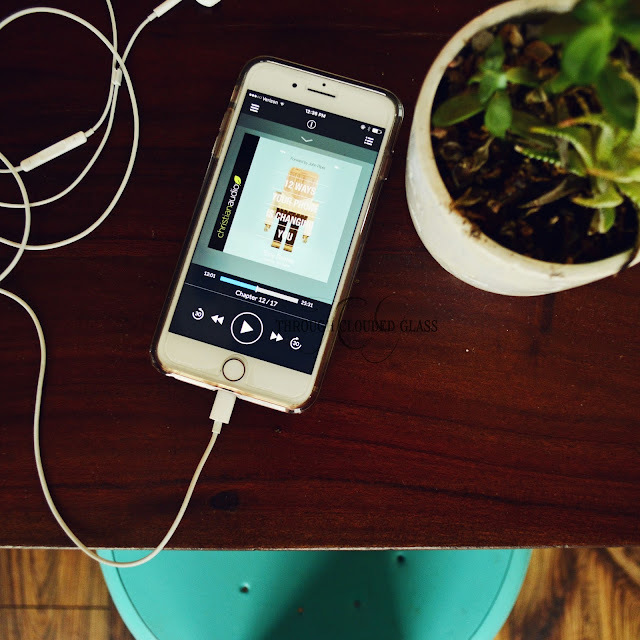 I picked up the 12 Ways Your Phone Is Changing You audiobook, because like many of you, I feel like I often check my phone too much. I thought this book would give me a good little kick to break some bad habits, but I got so much more than I was expecting! This book goes over different ways smartphones, and technology in general, has changed us not only individually but as a culture. The author incorporates different statistics and studies, and then takes a deeper look at the spiritual impact of our phone choices. He doesn't tell you what you need to do with your own smartphone habits, he just neutrally gets you thinking. There were two specific things in this book that really stuck with me. First, the author wrote that checking your phone or texting while driving (disclaimer: which I obviously try NOT to do unless changing my music - which maybe I should be careful about too) is a disregard for your neighbor - the neighbor who is in the car whizzing past you. You are not caring for your neighbor as you should, and as Scripture calls us to do, when you flippantly put them at risk like that. I had honestly never even thought about the whole don't-text-while-driving thing like that and thought he made some really good points. “Be careful not to practice your righteousness in front of others to be seen by them. If you do, you will have no reward from your Father in heaven." How sad is that? And once again, I never thought about it before, but I have been guilty too of trading eternal rewards for "likes" - guilty of caring more about men's applause than pleasing God. Now whenever I see those Bible posts, or those "humble brag" posts, I cringe a little more than I used to. Since listening to that chapter of this book, I've been trying to refrain from trading eternal rewards like that myself. It's a bad trade. There were so many other excellent points in this book, I'll honestly probably listen to it again. I even thought about buying the print version so I could highlight some of the pieces that I like. If you are like me and feel that little itch for an eternal perspective on your smartphone use, definitely check this book out! It's given me a lot to think about and has already motivated me to change some of my habits, and I highly recommend it. Note: I received the audio of this book for free from christianaudio in exchange for a review. This is my honest opinion. For this pregnancy (and my pregnancy with Clarice), I've received several comments to the effect of "Poor you! 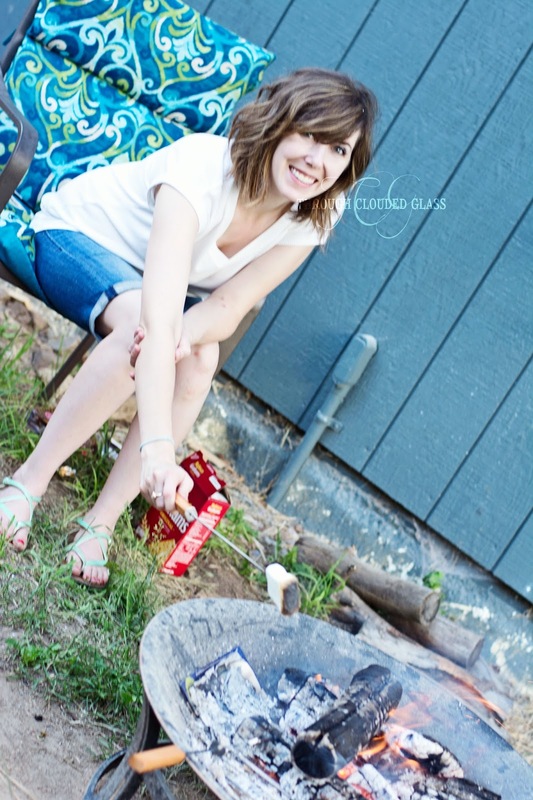 Is it hard being pregnant through the summer?" To which my answer is: no. 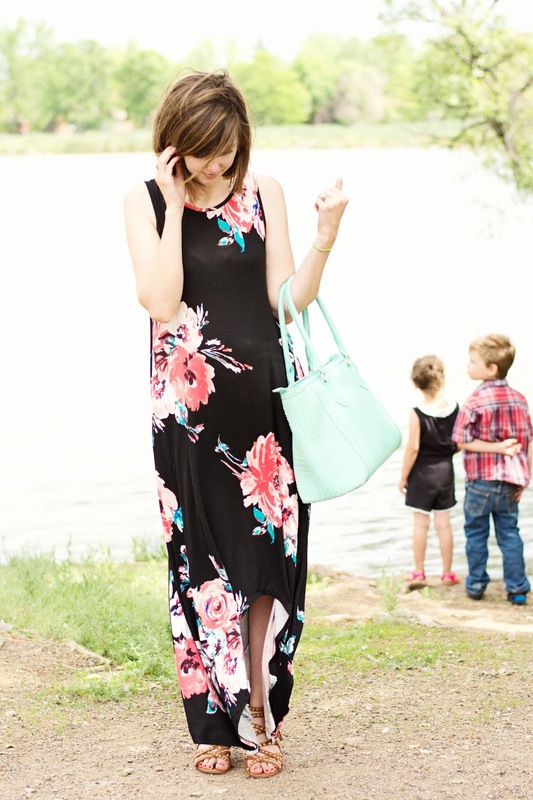 I actually enjoy being pregnant in the summer better than in the winter, and the major reason is cute maternity dresses! When you are pregnant in the winter, you still have to dress winter-appropriately, which means lots of layers on top of my belly. I hate that. 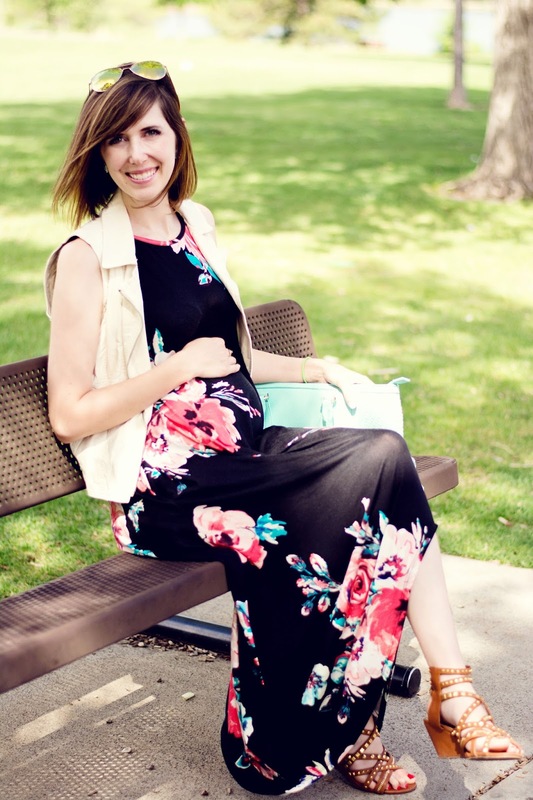 Summer pregnancies mean lighter fabrics, and comfortable, flown maternity dresses - and that's a huge plus in my book! 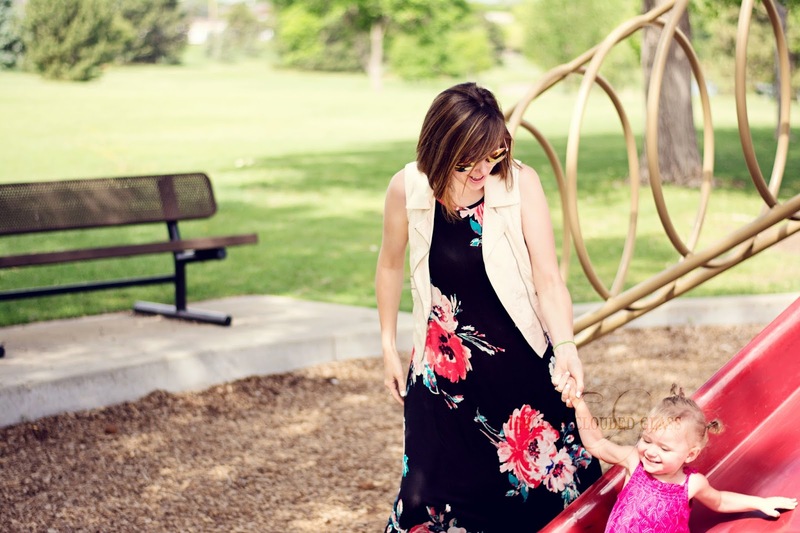 We took a quick trip to the park the other day, and I broke out my new favorite maternity dress from Pink Blush. This dress is seriously the most comfortable dress I own. 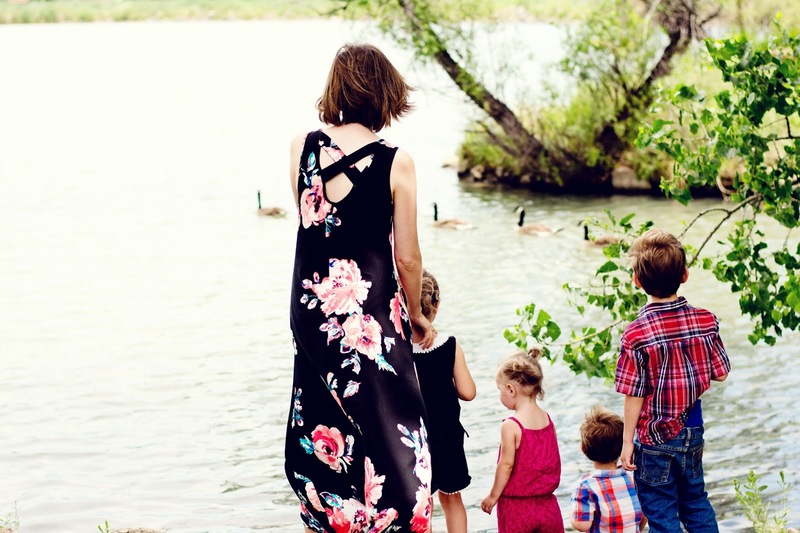 The fabric is so soft, it doesn't restrict me at all while covering everything comfortably - which makes it the perfect park-day dress, because I can run after the kids and move around so easily in it! I dressed it up a little with the white leather vest for church, but I abandoned the vest pretty quickly at the park - I actually like the look of the dress even better without it. The best part is that I think this particular dress is roomy and comfortable enough to last me through the rest of this pregnancy, and I'll be able to wear it post-baby too! 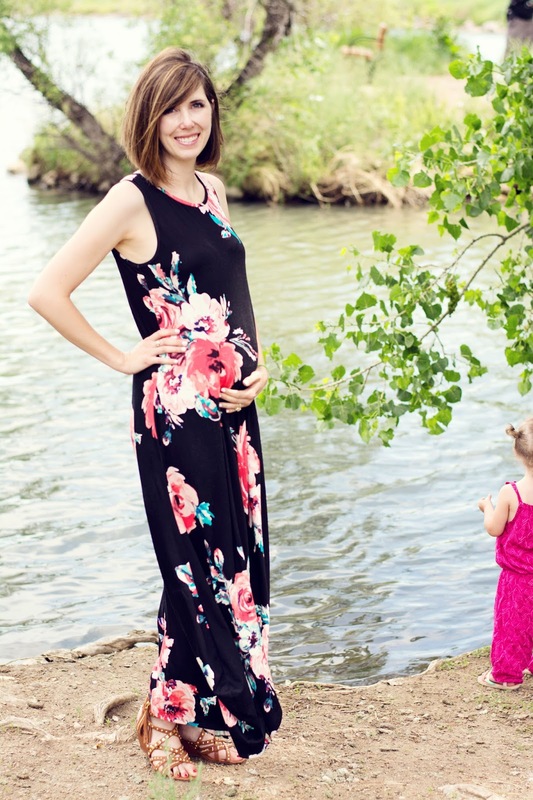 Where is your favorite place to buy maternity dresses? 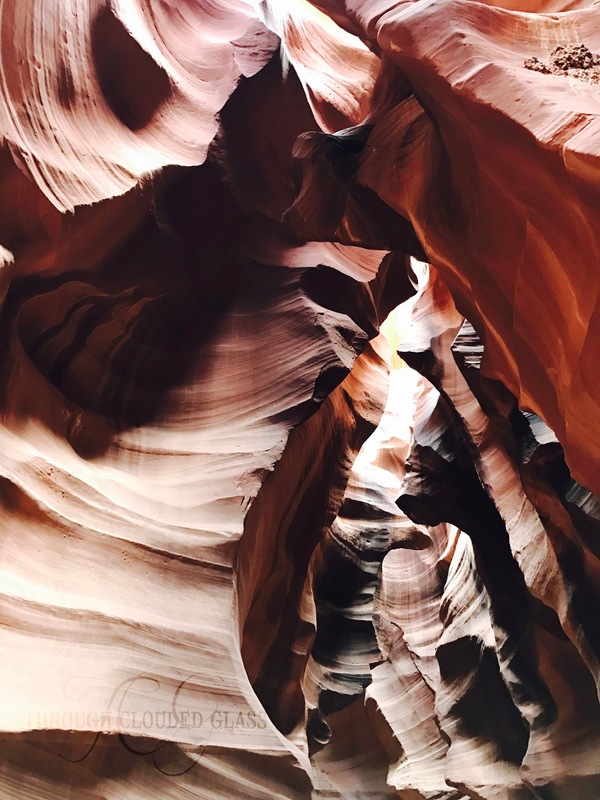 As I mentioned a couple weeks ago, we went to Arizona for vacation this year, and one of the places we knew we wanted to visit was Antelope Canyon! 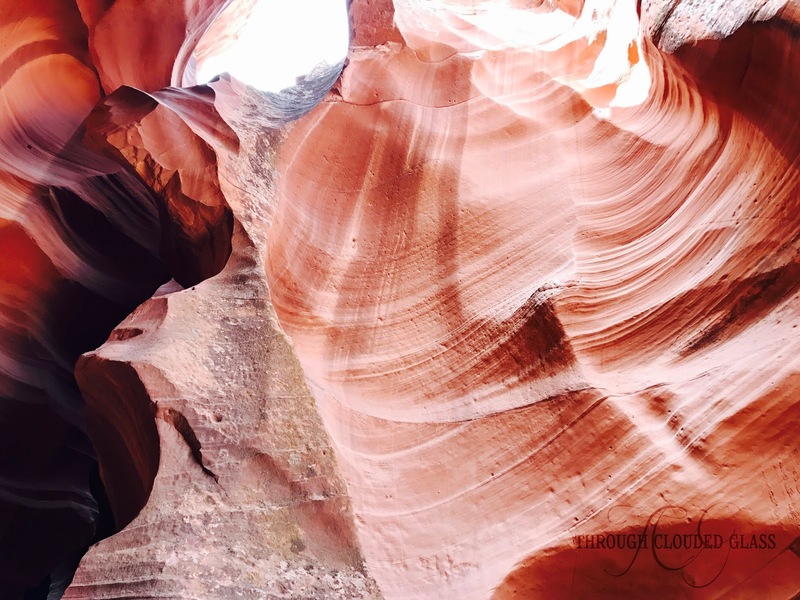 This is a slot canyon through the sandstone that was formed by flash floods. It is absolutely gorgeous and was certainly a highlight of our trip! 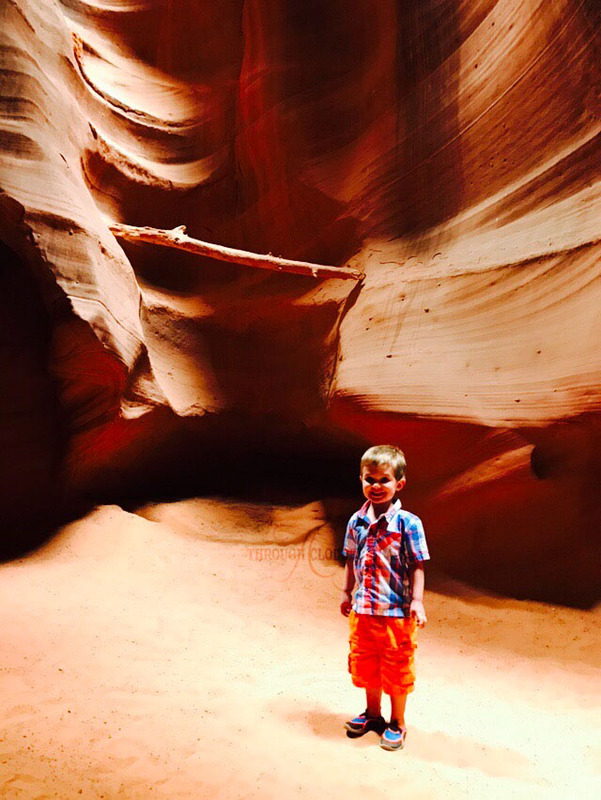 Flash floods can still run through the canyon, so you are not allowed to go into Antelope Canyon without a guide. Complicating matters, we also had four young kids (still in carseats) to take with us! Overall though, it ended up being very doable and really interesting for the kids as well as us! We decided to do a morning tour, around 8:00 AM, which we were told was a quieter time in the canyon. 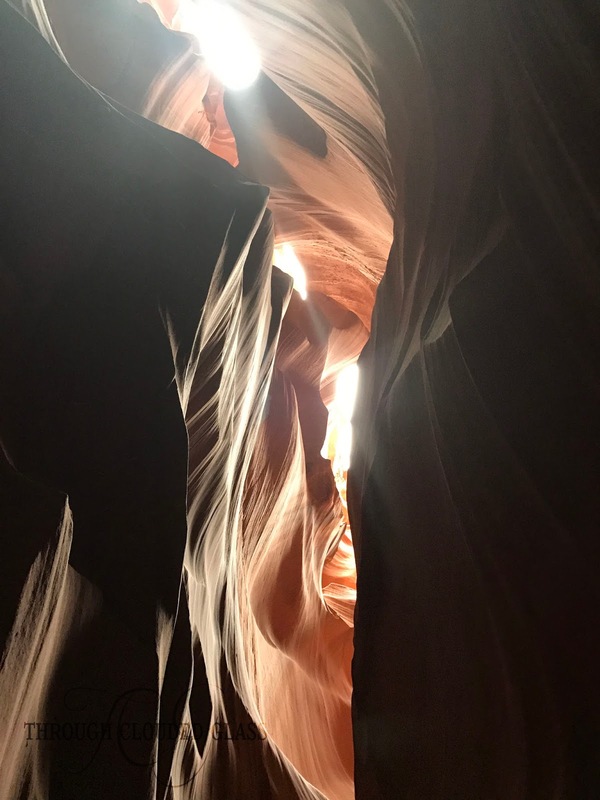 Many people like to go around "prime time", which is the middle of the day when light beams start shining through the rocks to the canyon floor. However, even though we went at a slower time of day, it was still very busy! There were people all around us through the whole tour, but the tour companies know to space their groups a tiny bit so you are still able to get some photos without other people in them. 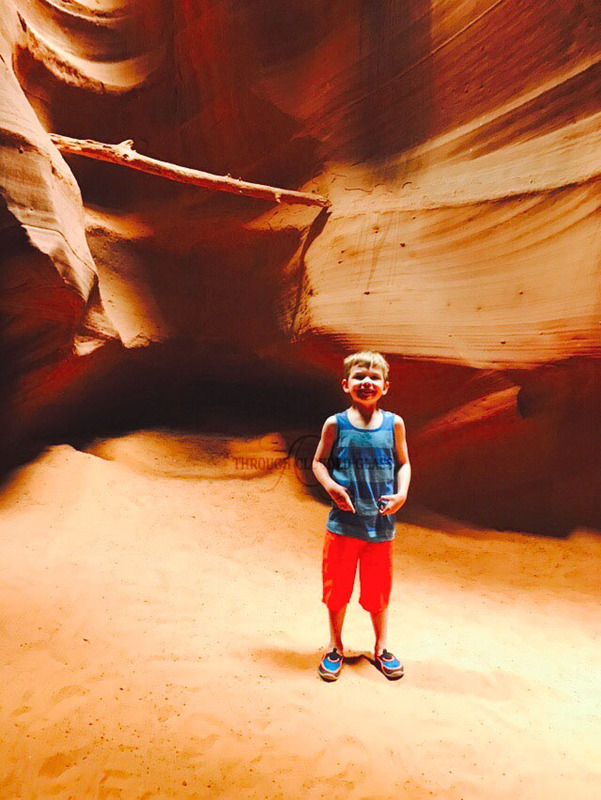 If you want to do Antelope Canyon with kids, be aware that Lower Antelope Canyon requires navigating some pretty steep stairs. 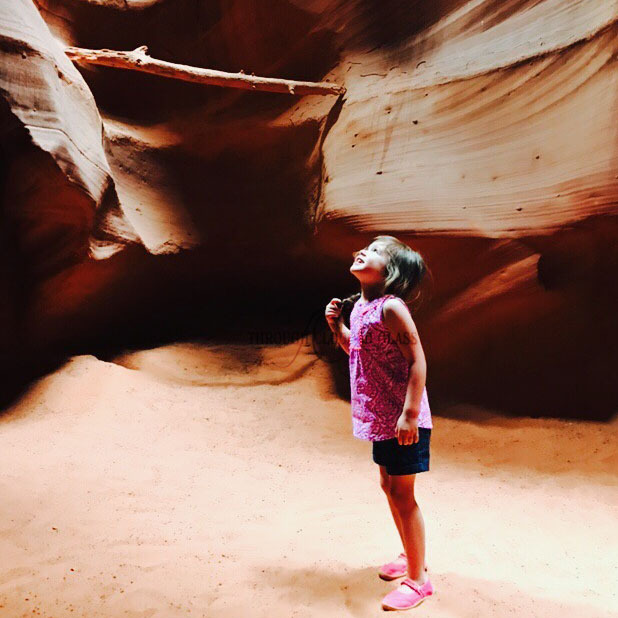 Our kids are a little young for that still, so we ended up doing a tour of Upper Antelope Canyon, which you just walk straight into. It was an easy, short walk, and was totally manageable even for our three year old. Book a tour ahead of time. We arrived in Page thinking we could book a tour on the same day we wanted to go (I had read that online), but many of the tour companies were booked two or three days out! 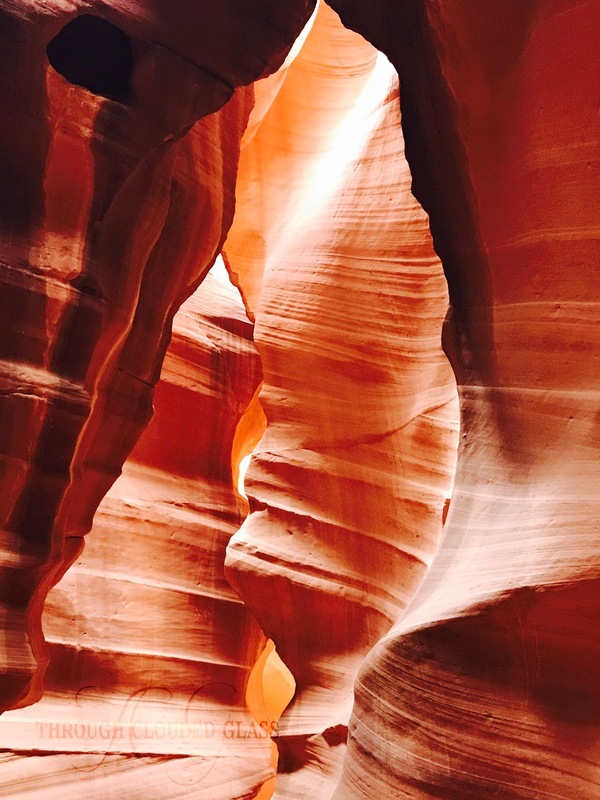 I would recommend picking a company ahead of time to visit the canyon. Make sure your tour company accepts young kids. I had done some research before we left and picked a company, only to find out when we arrived that they would not accept children under six years old on the tour because of an insurance issue. Thankfully not every company was restricted this way, and we were able to find another one! 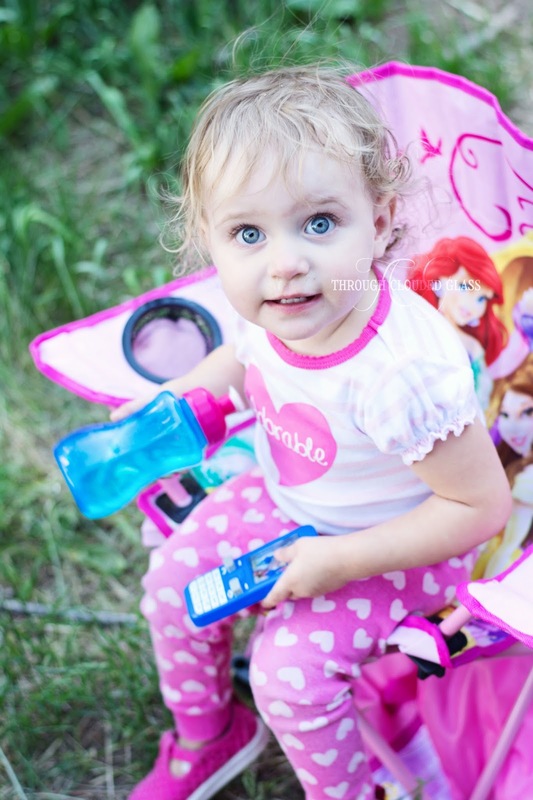 Call ahead of time to ensure that they can accommodate car seats if that information is not clear online. Realize that you will have to bring your own carseats. You are not allowed to drive your own vehicle out to the canyon, you must ride in your tour guide's vehicle. 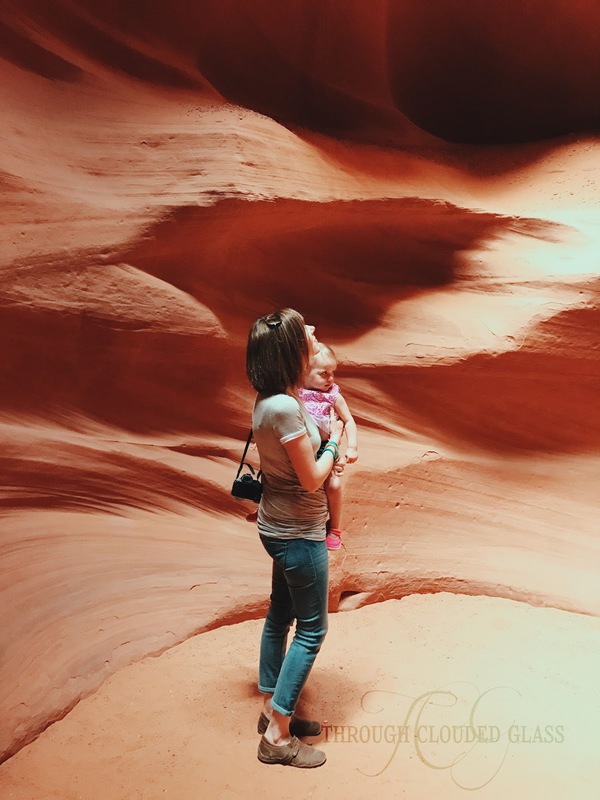 Make sure your tour company knows that you have children in car seats ahead of time, and arrive early to make sure there is time to get them installed in the vehicle. 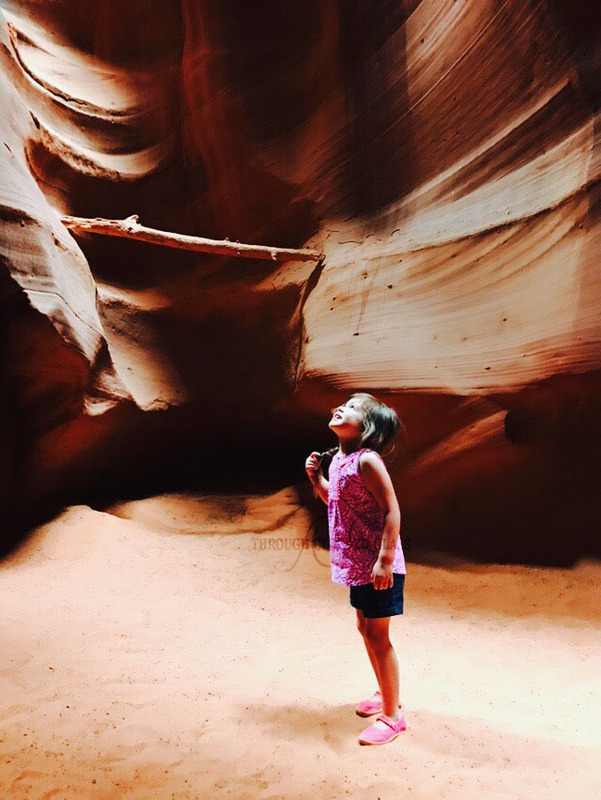 It's easy to run behind schedule when you have multiple young kids, but there are hundreds of people touring the canyon every day, and many tour companies coordinating their tour groups. If you are late for the tour, you will be out of luck, because they don't leave a second later than they are supposed to! If you have a baby carrier, make sure any buckles are tucked under a coat or blanket. They didn't let me bring my carrier in for Clarice because the buckles may scratch the wall and I didn't have anything to cover them with. 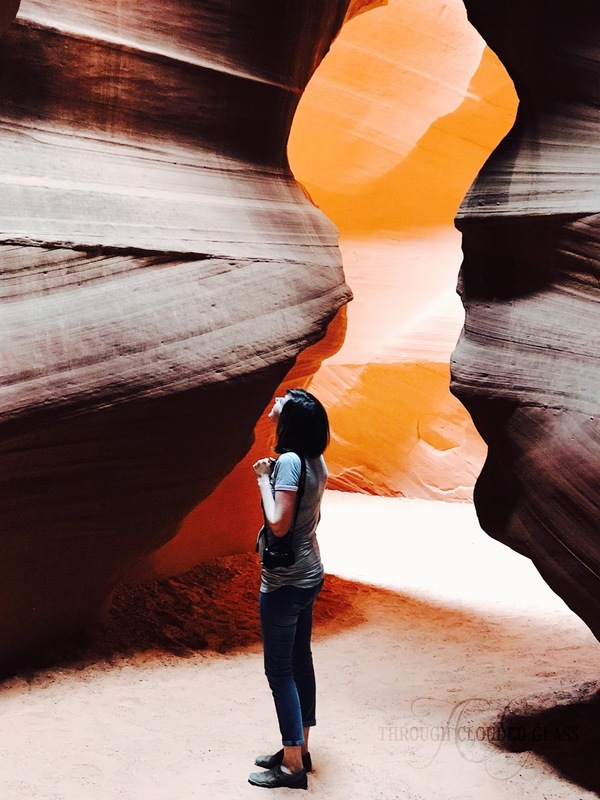 Thankfully the walk was only about a quarter mile for Upper Antelope Canyon, and it's an easy walk, so this wasn't a problem for us. Just to give you an idea of the cost, we paid for three people, 2 adults and one child (the other three kids were free with our specific tour company), and it ended up costing us about $180, plus a tip. You also must bring cash, because many of the tour companies do not take credit cards. Realize it's a quick tour. I was expecting the walk to be a bit slower, with more space and time to take some pictures of my family in the canyon. It was not like that. There were people everywhere, the tour guide was pointing out all the shapes in the rocks, and the walk in and out of the canyon itself was pretty quick! We still got some great pictures, but just realize it's busy and distracting in there. If you want more time to set up photos and such, I'd say the photography tours might be a better bet. 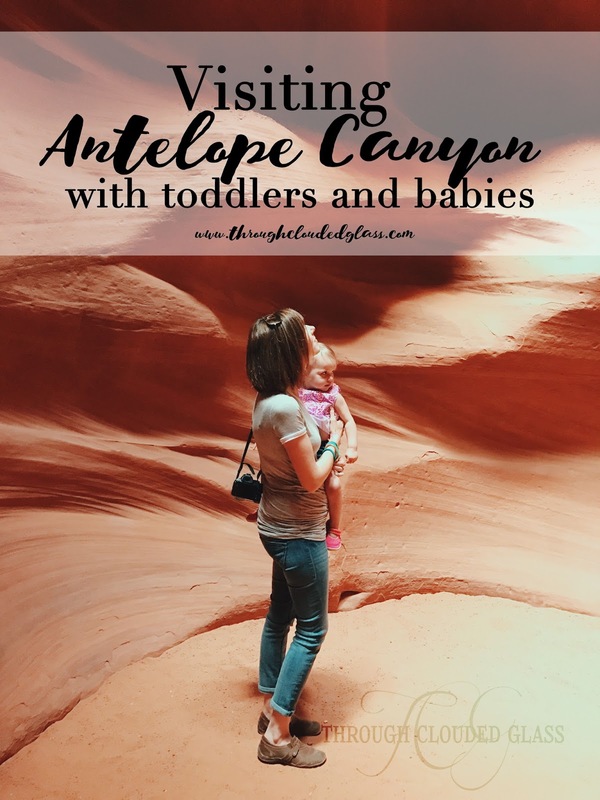 I did some research online about taking kids into Upper Antelope Canyon before we left, and I have to say, it had me a little freaked out about attempting it with kids! But it ended up not being a big deal at all. 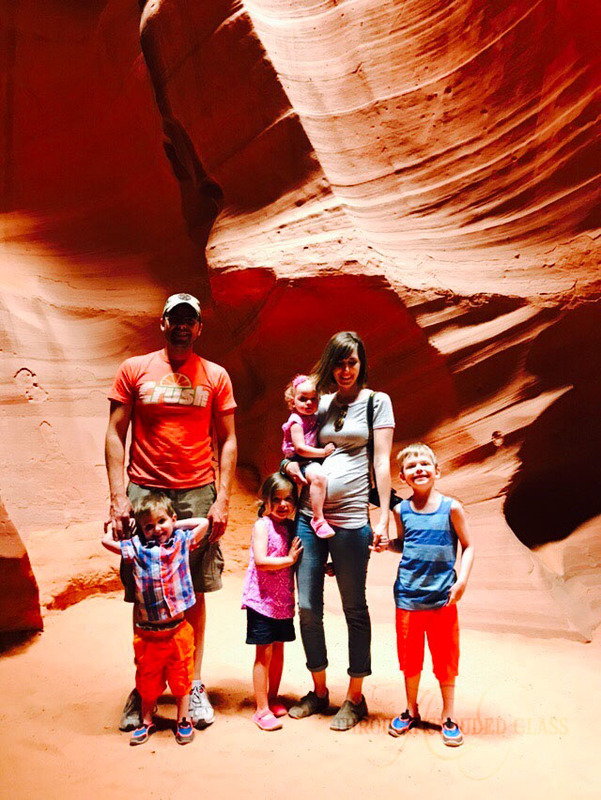 We took four kids under seven years old, and it ended up being an easy and fun outing! 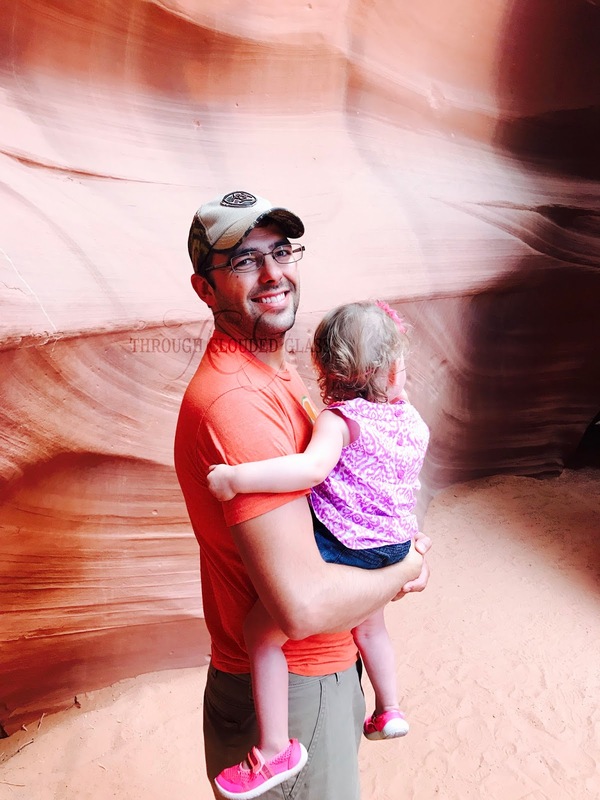 Definitely check it out if you are in the Lake Powell area! Any other questions for me about our experience? I'll answer to the best of my ability!